...It shocked part of me when I found myself thinking it, but another part of me thought that it was only a matter of time. This is the first time in the last ten years that I’ve given serious consideration to abstaining from voting. ...“What? !” you ask in disbelief. Yes, here I am, a civic-minded individual with a reasonable political science background and an addiction to C-Span, saying that I’m pondering the possibility of taking an election off from voting for the candidate who is the best of the worst. ...Casting a vote for U.S. Senate might be worthwhile but the others are looking bleak. My state representative joined his colleagues and voted himself an illegal pay raise, but is nonetheless loved by many constituents. My state senator is corrupt but is a shoe-in due to name recognition. My choice for governor is…um…well, that’s the topic of this post. ...On one hand I can choose Lynn Swann: former wide receiver of the Pittsburgh Steelers, motivational speaker, former wide receiver of the Pittsburgh Steelers, board member of the H.J. Heinz Company and Hershey Entertainment and Resorts, former wide receiver of the Pittsburgh Steelers, spokesman for Big Brothers/Big Sisters of America, former wide receiver of the Pittsburgh Steelers, broadcaster for ABC Sports, and former wide receiver of the Pittsburgh Steelers. I haven’t really heard how he would do it, but he says that he wants to create economic opportunities, prepare our children to compete in the working world with better education, and instill the traditional values of hard work, determination, and the will to succeed in all Pennsylvanians. ...On the other hand I can choose incumbent Ed Rendell: the former Philadelphia mayor who was notoriously involved in the Kvaerner ASA ship yard scheme in the late-1990s with cohort Tom Ridge. The two managed to funnel $430 million of taxpayer funds to convert the old Philadelphia Naval Yard into a commercial shipbuilding operation for Kvaerner, a Norwegian-based company, and both Republicans and Democrats on the local and state levels saw it as a chance to garner a few more votes. After all, they could tout the creation of thousands of jobs and tempt blue-collar workers all over the commonwealth with the possibility of increased steel production and new hires at many of the mills in the Keystone State. ...The Kvaerner deal began to take on the appearance of the taxpayer debacle that it was (a debacle to some people but not all; many former yard workers were angry when Ridge didn’t pay a German ship builder $167 million to do a similar deal in 1995) when the company opted to use both imported steel and Portuguese-made gantry cranes for their operation. In addition, tax monies would be used to fund not only a technologically-advanced yard but would also be used in worker training and payroll. All that Kvaerner had to do was show up and look good for the cameras. Eventually the news broke that along the way the big-wigs of Kvaerner were spending much of the tax subsidies on items like BMWs, grand pianos, and renovations to private residences. ...In 1999, Kvaerner announced that they were pulling up stakes in Philly due to limited ship orders, but, as is popular in politics, someone somehow pulled the right strings and managed to keep Kvaerner at the yards. In 2005 they signed a $1 billion contract for the production of ten double-hulled tankers and the black mark on Rendell’s résumé became old news. ...In recent years he found himself under fire from a group of constituents that is usually supportive of Democrats: environmentalists. Rendell is opposed to banning dumping harbor sludge in the commonwealth—some of which has been shown to be toxic—and came under fire when he openly said that he opposed a bill, House Bill 2275, that would allow people to vote on whether or not their community would allow the potentially-hazardous sludge to be dumped in their backyard. In 2004 he firmly stated, “Well, I’m not for letting anything be decided by referendum and that would be what this bill would try to do, Dante,” in his response to a caller on a public affairs show. ...Maybe I shouldn’t worry about this, though, because the possibility exists that a winner has already been picked. Only a few days ago it was announced that Diebold, which has a history of security problems with their electronic voting machines (click here to read some scary information that I discovered a few months ago), has sold machines with yet another security flaw to several Pennsylvania counties—including mine. ...So who will it be, Diebold? Swann or Rendell? who or what is aqui? “Aqui” is Spanish for “here.” In areas that have significant Spanish populations it’s common to see signs reading “VOTE AQUI.” I’ve always thought that it would be perfect to field a candidate named Aqui simply because he/she would find himself/herself with a lot of free campaign signs. It’s kind of like why The Police decided to call themselves “The Police”: Drummer Stewart Copeland explained that they wanted a name that would be uttered on a daily basis by at least one person in the country. You know there are going to be people who show up at the polling stations (hey, at least they showed up) and searching the ballot for a guy named Aqui. 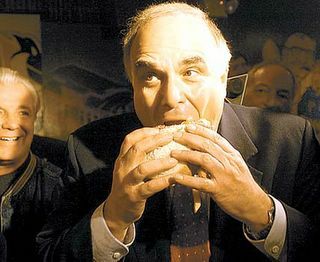 The pic of Rendell is disgusting. He really did get his mouth around that sandwich! Amy, if that’s the case I’m going to legally change my name to José Aqui. It sounds mean, but when I searched for a Rendell image, most of them were the standard profile photos or a few of him from photo ops around the commonwealth. Then I discovered the sandwich shot. I just had to use it.